While the kids enjoy the fun, safe, playground at the Waterfront Park, you can relax on a bench and have a front row seat as the carferry glides by. Pick up an ice cream cone ahead of time! This is the closest you'll get to the carferry. Give yourself an extra ten minutes to walk out to the very end past the North Breakwater Lighthouse, and actually see the faces of the people enjoying their cross-lake trip. The entire area between the City Marina and the Coast Guard Station is a popular gathering place for people to watch the carferry and wave hello or goodbye to its passengers. Large, white boulders line the walk, beckoning children to climb, but be careful! 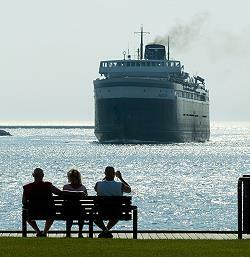 The large expanse of Stearns Park Beach gives you the longest view of the S.S. Badger. 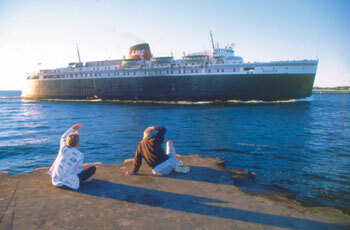 Watch as she sails into the horizon, and stay for the spectacular sunset over Lake Michigan. Situated across from the city marina, PM Steamers is appropriately named for Ludington's carferry history. Have a drink or dinner out on their deck, and you've got the perfect combination. Hike out to the Lake Michigan Beach House within the Ludington State Park along the lakeshore, set your blanket on the sand and let the tranquility embrace you as the S.S. Badger sails into or out of her home port.